Corby Gates Farm, is a working sheep farm in an area of outstanding natural beauty. The homestead at Corby Gates has existed since the 11th century. 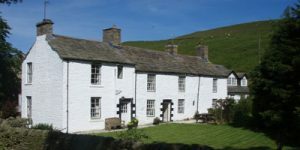 It is mentioned in the ‘pipe rolls’ of Henry II in 1279, which makes it one of the oldest steadings on Alston Moor.The property has undergone a complete restoration. As can be seen from the images all of the original features and character of this traditional Cumbrian long house have been retained. This 8 bedroom farm house has now been luxuriously furnished and equipped to an excellent standard. It can now be booked for large family’s and groups of up to 16. The Bedrooms. Each of the bedrooms retains the original features of the house. The rooms are finished to a high standard. The Kitchen. The large farmhouse kitchen with stone flagged floor and oak beams forms the heart of the house. The opposite end of the kitchen has a cosy seating area with wood burning stove making this area the focal point of the house. The Lounge. This comfy seating area contains sufficient seating for all 16 guests. A wonderful place to relax and walk, in a great location with stunning views. We had a family celebration for my mum’s 70th birthday. Everything was perfect and Frankie & Colin were ever so friendly.